"Thousands of Houston homes flooded already," Stringer, founder and president of Turning Point Ministries International, tells Charisma News. "Many stranded. We're getting messages for need for help and seeing many FB notices for people who need rescue. I'm actually currently stranded in my home too. 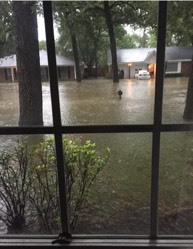 Our street is like a river, and the retention lake behind us is rising rapidly. It's like a river rising next to our home because there's nowhere for the water to go. Our roof is leaking in different places, and our chimney is like a slow waterfall. There are tornado warnings every few minutes in our area. My wife and I are praying for everyone we can as we hear of their need. We are declaring, like Elijah, the Word of the Lord for the diminishing of the rain and waters to recede throughout the region." Reports confirm the storm has killed three people, and the death toll continues to rise. Though the initial Category 4 hurricane was downgraded to a tropical storm, damage escalates. More than 30 inches of rain are expected to saturate the city and beyond. Some areas are expecting up to 50 inches, the highest ever recorded in Texas. Houston's mayor says more than 2,000 residents have called for rescue. Hope, though, is rising faster than the flood waters. In one viral image, a dog is seen carrying a bag of food. The dog, who quickly captured the heart of the internet, is just one refugee of thousands. Stringer says 12 million out of the 28 million residents of Texas are now under a flash flood warning. Tornadoes have been touching down in Houston's surrounding area due to air shifts. "Water is now rising from the street and almost to the house," Stringer says. "We are praying, worshipping and declaring the greatness and goodness of the Lord. 911 in Houston is overloaded and already has thousands of requests for rescue. I'm moving my mother-in-law, wife and daughter upstairs soon with water and supplies." Dozens of ministries answered Houston's call to help, including the Billy Graham Rapid Response Team, Convoy of Hope, Somebody Cares and Samaritan's Purse, among others. Jodie Chiricosta of Somebody Cares tells Charisma News the nonprofit is prepared to respond with direct aid like hot meals, generators, cleaning supplies, tarps and volunteer clean-up teams to help those in Harvey's wake. "We have identified staging locations from Brownsville, Texas; to Corpus Christi; to San Antonio and Houston. Our network has assets positioned within hours of the forecasted landfall area and supplies are being brought into the region to distribute once the storm subsides. We have mobile kitchens, a shower trailer, BBQ pits, generators, hygiene supplies and teams ready to move into the area as soon as it is safe for teams to respond." Harvey stormed ashore as a Category 4 hurricane and has left a path of devastation. As of Saturday afternoon, officials say that half of Texas' 25-plus million residents and 1/3 of Texas' landmass have been impacted by Harvey. The cities of Rockport and Victoria have been particularly hard hit. A Somebody Cares team has arrived in Corpus Christi and is currently assessing the damage and needs along the coast from there northward to Victoria and Rockport. Since Harvey continues to dump rain as a tropical storm, many additional communities in and around Galveston, Houston, the Texas Hill Country and surrounding areas are preparing for evacuation due to the expectation of severe flooding. Current plans are to establish a first-staging area and service base in Victoria, where we will begin serving hot meals in conjunction with ministry partner Mercy Chefs and distributing needed supplies. We continue to be in constant communication with churches, ministry partners and government agencies so we have real-time assessments. Of course, these plans may change and will expand as conditions and needs on the ground shift. The scale of this disaster is expected to be unprecedented in recent history, with millions of families, homes and businesses impacted. Please pray for those who are being impacted by this ongoing storm, and give a generous donation today so we can rush real aid to meet the needs of real people! "We see this as an opportunity to demonstrate God's love and care for people," says Jack Munday, international director of the Rapid Response Team. "For them to know that God hasn't forgotten them." Convoy of Hope arrived in Texas on Friday, saying: "Our Disaster Services team continues to respond to Hurricane Harvey. Winds reached 130 mph overnight, and southeast Texas is expected to receive up to three feet of rain ... The advance team is in Corpus Christi today working with local partners to identify the areas of greatest need and stage product where we can host distribution sites in the coming days. The rest of our team and disaster services fleet plan to arrive later today, weather permitting." Prayer continues to be a huge focus as disaster relief efforts take on the flooding and rain. "My heart continues to be heavy for the good people of South Texas as they begin to deal with the devastation caused by Hurricane Harvey—and the flood waters are still rising in many areas," said Franklin Graham, president of Samaritan's Purse. "We have pre-positioned Samaritan's Purse disaster relief trucks and materials outside Dallas and will be moving into the hardest-hit areas as soon as we are given the all-clear by the state authorities. We hope that over the next few months there will be thousands of volunteers who will want to come and help those whose homes have been damaged by this destructive storm."